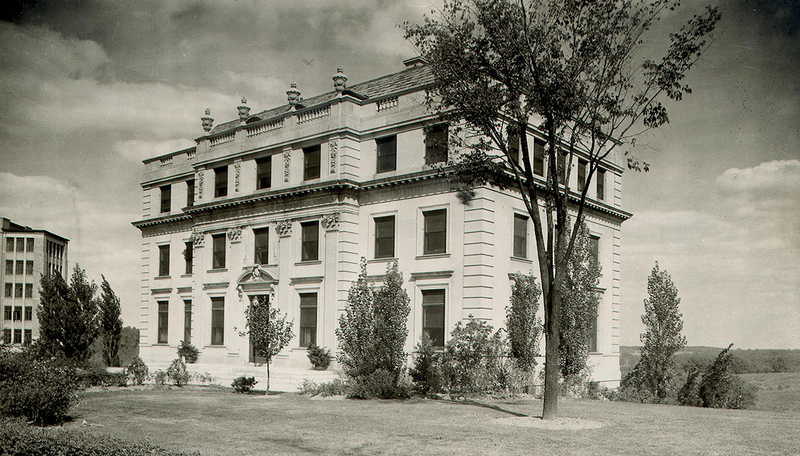 The Simpson Memorial Institute, pictured at far right on the Hospital Campus in 1932, housed a library, offices, laboratories and accommodations for 10 patients. In 1924, Christine McDonald Simpson,* the widow of Detroit iron magnate Thomas H. Simpson, donated over $400,000 to the University of Michigan in memory of her late husband, who had died of pernicious anemia the previous year. Her objective was to endow a state-of-the-art, clinical research facility to study and find a cure for pernicious anemia, which until the early 1920s had been considered an inevitably fatal condition. Three years later, on Feb. 10, 1927, the Thomas H. Simpson Memorial Institute opened its doors in Ann Arbor. The granite, Beaux-Arts building on South Observatory Street — complete with a walnut-paneled lobby and library, offices, laboratories and accommodations for up to 10 patients — was designed by renowned architect Albert Kahn. Cyrus Sturgis and Raphael Isaacs, two prominent Massachusetts physicians affiliated with Harvard University and Brigham Hospital, were recruited to run the Institute and its new staff. The Simpson Memorial Institute was endowed at a time when clinical facilities and funding dedicated to the study of a single disease were rare. In fact, the first major biomedical research institute in America, the Rockefeller Institute for Medical Research, was funded about two decades earlier. Only two years after the institute opened, Sturgis, working with experimental medicine researchers at the Parke-Davis Company, presented an effective treatment for pernicious anemia: ventriculin. Derived from dried and defatted hog stomach, ventriculin was revolutionary in the treatment of pernicious anemia. The Detroit-based pharmaceutical company began mass-producing the product soon after the first Simpson patient was successfully treated in June 1929. By 1930, the number of pernicious anemia cases treated at the Simpson Institute grew exponentially, despite the relative rarity of the disorder. In his 1931 report to the Board of Regents, Sturgis remarked that “the widespread publicity given to the new treatment has placed in the hands of the family physician an efficient method of treating these patients in their homes rather than sending them to the hospital. Yet ... patients have come from all over Michigan, as well as from many other states,” to benefit from the institute’s cutting-edge research. From the very beginning, it was clear that the clinical research facility provided a much-needed benefit for the Medical School. Not only did the Simpson Memorial Institute help to elevate the prestige of the university, its medical faculty and its other clinical facilities, its work also dovetailed with clinical instruction and provided new opportunities for U-M medical students to combine scientific and bedside learning, such as Isaacs’ thirdyear elective course on blood diseases, taught on both the wards and in the laboratory. Having effectively “conquered” what it initially set out to do with Christine McDonald Simpson’s gift, the institute’s building has taken on other purposes and is now surrounded by towering university buildings that include the hospitals of UMHS and the School of Public Health. Today, the building is home to, among other things, the U-M Center for the History of Medicine and its collection of rare medical paraphernalia and artifacts. * In various secondary sources and memorials, Christine McDonald Simpson is referred to as “Catherine.” Primary records from Detroit prior to her husband’s death identify her as “Christine.” For example, see The Social Secretary of Detroit (1922), p. 128. Christian, Henry A. “The Significance and Relationships of the Thomas Henry Simpson Memorial Institute for Medical Research.” Science 65 (April 15, 1927): 359-61. Davenport, Horace W. Not Just Any Medical School: The Science, Practice, and Teaching of Medicine at the University of Michigan 1850-1941. Ann Arbor: University of Michigan Press, 1999. Medical Lives and Scientific Medicine at Michigan, 1891-1969. Joel D. Howell, ed. Ann Arbor: University of Michigan Press, 1993. 73-100. “The President’s Report for the Board of Regents for the Academic Year of 1929-1930.” Ann Arbor: University of Michigan Press for U-M Libraries, 1931. 385-388. “Section II: Development of the Institute’s Research Activities.” Research News 16.4 (October 1965): 12-14. Sturgis, Cyrus C. “The Thomas Henry Simpson Memorial Institute for Medical Research.” Phi Chi Quarterly 25.4 (May 1928): 602-609.